5-31-10 GREAT Memorial Day Weekend! We had a wonderful weekend at home! Got to go in the hot tub twice with Ally, Melissa and friends. BBQ’d several times, relaxed on the deck, tried a new church out, relaxed, hung out with friends…. Click on the album cover to see ALL the pictures. 5-26-10 Busy, BUSY, BUSY – but doing WELL!!! and PLEASE donate! Just wanted to do a quick update and share some new pictures. Also need to put out an additional plea for friends and family to PLEASE sponsor Ally in the IL Families of SMA Walk and Roll which is quickly approaching June 12th. If you’d like to walk with us it is best if you can register by June 1st to ensure the correct t-shirt size. I know a few of you continue to donate to the Angel Allyson Fund NFP and/or walks, but I’m begging for additional “new” friends and family to PLEASE consider donating so that one day soon a CURE or treatment can be found for Ally and her friends. We do two walks each year for Families of SMA (June) and the MDA (September). Both of these organizations have helped us a ton in support and they also both invest lots of $$$ in clinical trials working towards that CURE. To donate and/or join the Ally’s Angels Team….. go to http://www.fsma.org/LWC/httpwwwsmarglly. Even $5 makes a difference and its super, super easy to donate online. It’s also a tax deduction. I’m a little sad to say only 3 friends have donated so far for this walk and only 2 families are joining us so far. We’ll never reach our team goal of $1000 unless we have your help. Thank you in advance for your support!!!! As the title of this blog states, we have been Busy, BUSY, BUSY – but doing WELL!!! Ally seems to be completely over her mysterious illness. The combo of the two antibiotics and extra treatments really did the trick. She is above her baseline and feeling great!!! We have begun to get out of the house almost every day to do something. We have also been spending lots and lots of time on our wonderful deck. My mom ( Billy,and kinda I) have been doing a TON to make the deck and yard look extraordinary. Now we can begin to have family and friends over. 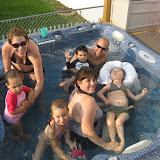 Who wants to visit and go in our hot tub from Make a Wish (set at a cooler temp for summer) or BBQ with us? I’m very serious, call or email, we love visitors and have no plans yet for Memorial Day Weekend. Good news, I have decided to give preschool another try for Ally. The new principal at Stock School is a wonderful, caring person and asked me to give it another try since Ally really deserves to experience school. They are working super hard to meet Ally’s unique needs with her spending time in both the blended and special ed classrooms. She has a designated aid who will only be working with her and our home nurse and/or I will be with her too. There are still lots of kinks to work out, but most of it needs to be resolved with the higher ups of CPS. I do have high hopes that it will all work out though. SUPER amazing news is that the old principal of Stock, Dr. Smith, has been promoted to the Head of Special Ed for all of Chicago Public Schools. It’s nice that he knows Ally and I well and he always has the best interest of children in mind. We still need to be extra cautious of germs, but the school will also be working hard to take the best precautions too. The regular school year ends June 16th, but Ally also qualifies for 6 weeks of summer school. Summer school begins June 21st and is Mon-Thurs 8:30am-12:00pm each day. We will try to make the majority of the days, but will take some days off if we don’t have a nurse and/or want to have a family day. Below are some pics from late April and May. Each picture is an album cover, so be sure to click on the cover to see additional photos. Please consider donating to the Walk and Roll in honor of Ally and/or joining the Ally’s Angels Team. Also be sure to let us know what you think of the pics and how you and your family are doing. PS — Forgot to mention, Melissa is graduating from Kindergarten and Kristyn is graduating from 8th Grade June 15th and 16th. I am so proud of all my girls, especially Kristyn who is 2nd in her 8th grade class for grades. She will be giving a small speech at graduation (like her Mommy did when graduating 8th grade). As I mentioned before, she also tested academically into Lane Tech College Preparatory High School and has made the varsity cheerleading team. We will be having a graduation party for both girls at our home on Saturday, June 19th at 1:30 pm (food served at 2:30 pm). All friends and family are welcome to join in our celebration and see our new deck and “Make a Wish” hot tub (bring a suit if you’d like). If coming, please email tina@angelally.com or call me 773-283-7211 so I can plan food — the more the merrier! 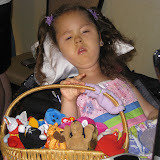 These are four are from April 2010 and show some of the special things Ally can do at 4 years old with SMA Type 1. A typical person might look at her limited movement in these movies and think “no big deal”, but we are soooooo proud of Ally being able to do these things. SMA affects ALL of her muscles – breathing, swallowing, moving, talking (but not her brain and feelings). Once a child loses movement because the body is not making protein for the muscles, it usually does not come back (atrophy means to shrink and die off). Somehow, Ally is gaining strength and finding ways to do new things as she gets older. She is on a clinical trial drug and some medicines that might help increase the protein production; these are hydroxyurea and liquid albuterol and we also use levocarnitine. None of these are proven treatments though. That is why we need funding for new clinical trials and especially gene therapy and stem cell treatments. 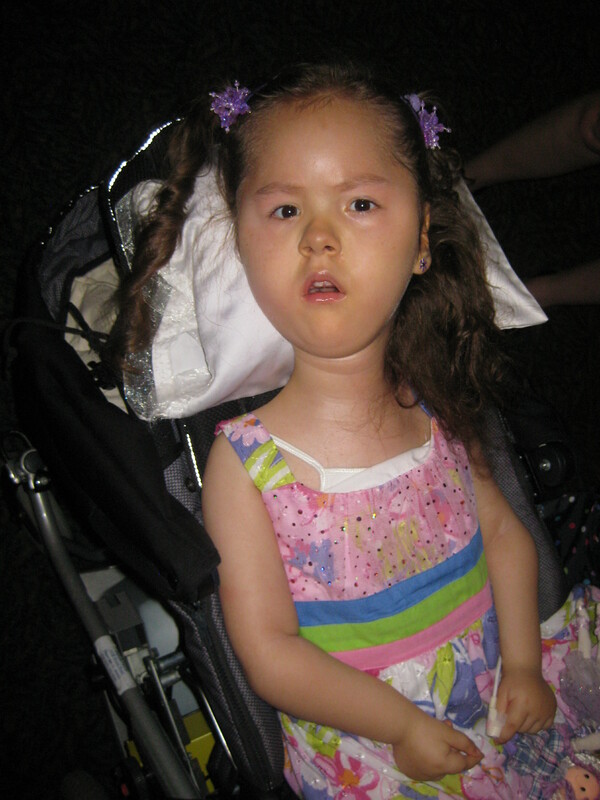 A cure CAN be found in Ally’s lifetime, but funding is what is holding us back. Please consider donating to our IL FSMA Walk which is June 12, 2010. Go to http://www.fsma.org/LWC/httpwwwsmarglly to make a donation and/or join our team! We are so proud of Ally and all that she overcomes on a daily basis. She is truly an angel on earth teaching others about life, friendship, courage, faith…. Please never feel sorry for her. She is a happy child and we are all blessed to know her. I’ll admit, I’ve been a bit emotional lately with the deaths and illnesses of several sma children this winter and spring, but I need to celebrate the joy of having Ally and continue giving her and her sisters the BEST life possible. Thank you friends and family for your continued prayers and support!!! 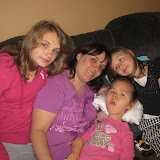 Need support – SMA Fundraiser Walk Quickly Approaching – PLEASE donate and/or join Ally’s Angels team! The Krajewski Family does 2 walks each year to raise $$$ for a CURE for SMA and support for families. Will you PLEASE consider making a donation TODAY (or before June 12th) in honor of Ally? Also looking for team members. Please donate in honor of Allyson Krajewski who is 4 years old with Type 1 SMA. 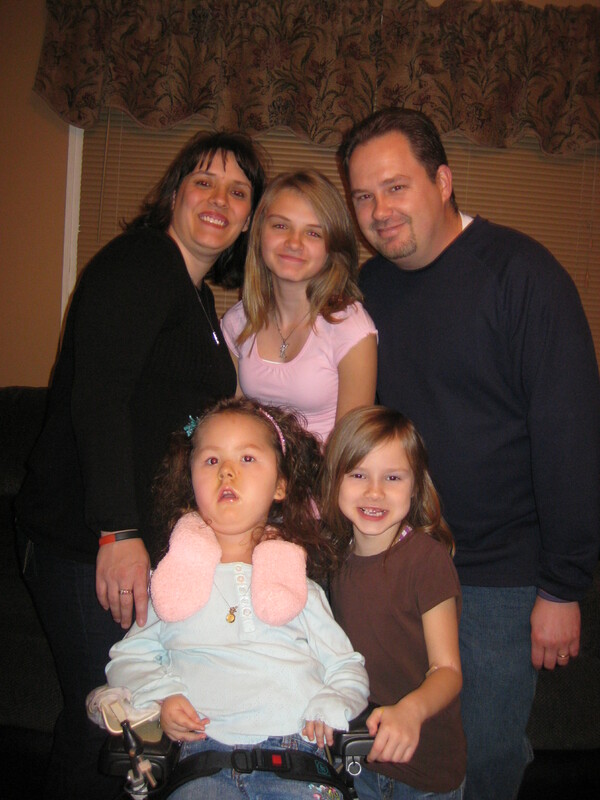 Ally and her family are praying for a cure or treatment for SMA in her lifetime. This can only happen with proper funding for clinical trials and support for families. The National Institue of Health has declared SMA as the closed neurological disease to a cure and a gateway to cure many other diseases. Will your donation be the $$$ that allows a cure a to happen for Ally and many others? If you’d like to join the Ally’s Angels Team and help raise funds, please contact Tina at tina@angelally.com or 773-283-7211. You can also check out Ally’s latest blog updates at www.angelally.com. Go to http://www.fsma.org/LWC/httpwwwsmarglly to make a donation and/or join our team! Donating through this website is easy, fast, and totally secure. This is also the most effective way to support my fundraising efforts for Families of Spinal Muscular Atrophy. Main Walk route is 2.5 miles, there is a shorter route option if requested. The trail is paved and runs through scenic areas of the preserve. There is a wheelchair accessible play area that is a sensory-rich play environment with state-of-the-art handicap-adaptable play equipment and wide paved pathways, making access comfortable and enjoyable for all visitors. Food and beverages will be offered. A DJ will help get the crowd motivated and warmed up for the walk. Lots of fun for a great cause!! Spinal Muscular Atrophy is the number one genetic killer of children under the age of two. SMA is an inherited and often fatal disease that destroys the nerves controlling voluntary muscle movement, which affects crawling, walking, head and neck control, and even swallowing. Two new-born children are affected each day in the United States, approximately 1 in 6,000 live births. One in every 40 people carries the gene that causes SMA, which means there are more than seven million carriers in the United States alone. Currently there is no treatment or cure. Families of SMA is an international nonprofit organization founded in 1984 with the mission to find a treatment and cure for SMA. FSMA is made up of more than 65,000 members and supporters and has funded more than $50 Million in leading research programs since its inception. PS — Also in need of donations for our raffle (Tickets, gift certificates, prizes…). Contact Tina or Janet if you can help!!! For those interested, the new antibiotic Ally is on is Bactrim, in addition to Tobi nebs. The doctor said we should continue on with the plan of using both of these for 14 days and hopefully we will knock everything out of her and be good for the summer. Ally has most likely colonized MRSA and pseudomonus and she has had several other gram positives and negatives in the past. The combo of these two should hopefully work well, along with her respiratory treatments. My little girl has been up since 3:30 am, happily watching movies. She is finishing up another treatment and then will hopefully take a nap. I rested a little from 6:30-8:30 am with the monitor on. Kristyn was amazing and got her and Melissa off to school and even made lunches. I love when family works together to make the days go smoother. Special thanks to the Burgheosi (?sp) for driving them to school while my mom is out of town. DSCC meeting soon…. Better clean myself up a little. Since I’m up checking on Ally, thought I’d send a tiny update on my mysterious child. Ally had a good end to her night happily watching her movies in her room. Billy did her breathing treatment (thank you sooo much) and I layed down early with a headache. She did fine with her treatment and was sating in the mid to upper 90s for o2 and no fever. Just now her alarm was going off, so I got up for a treatment. She is actually satting upper 90s, but the alarm went off since the sensor wasn’t picking up properly. She has no fever and her HR is great. As I type, she is vocalizing since I accidently woke her. Gonna see if she falls back asleep or I might go ahead with an extra treatment and let her watch some cartoons. Luckily we have Nurse Lucy today, so I can maybe take a small nap after my annual meeting with DSCC (Division of Specialized Care for Children) and Ally’s wheelchair/stroller delivery. A tray was built for her size 2 stroller and I’m excited to see it and transfer all her equipment. Just hope this headache goes away. It’s probably just stress, hopefully nothing more. I’m super confused if she really needs the new antibiotic and to keep doing her Tobi nebs for 28 instead of 14 days. I think the non-generic name of the new antibiotic is bactroban and if her MRSA is flaring up it would treat that and I’m not sure what else. I really don’t want extra antibiotics if she doesn’t need them, but didn’t want to start too late and end up in the hospital. I may call the doc today and see. He’ll probably think I’m a bit crazy when I describe how well Ally seems to be doing now compared to yesterday afternoon. She’s still talking, so I’ll go ahead with an extra treatment. It won’t hurt her other than her pattern of sleep being off. Have a good day everyone and thanks for the prayers and well wishes. PS — Are you voting everyday, till the end of May, for the two SMA organizations in the Pepsi Refresh contest? Be sure to go to www.RefreshEverything.com and search “SMA” in the top corner. Sign in using facebook or your email and vote for both. We really need help to get into 1st or 2nd to win $250,000 for SMA research. Thanks in advance for voting and also spreading the word!!!! My daughter, Ally, is quite the mystery child. She had a nice end of last week and overall a great weekend and so I did a “happy” update yesterday, but this morning she had low oxygen sats again and then a fever this afternoon. She had a regular pulmonologist appointment today and he was pretty concerned, but is continuing to let me treat her at home. She is not using o2, but did have a desat into the 60s this morning and then we are seeing some periods of low 90s and then later upper 90s. We started another new antibiotic and are extending the other one (her Tobi nebs). At the moment she is doing well, but her day seems to be going up and down. She is overall in a happy mode, but I hate that something is going on (again). It’s that time of the year for illnesses with all this crazy weather and also allergies. I also took her to a school play Friday night to see her oldest sister, so I am blaming myself some. The tricky part is I have vowed we will not ever live in a “complete bubble” and we need to do special family things. I want Ally to experience life, but then we also take the risk of exposure to germs and illnesses. For now, I just have to keep up with her treatments and keeping her happy. I’ll try to keep everyone updated. I have high hopes the antibiotics and treatments will do the job, keep Ally out of the hospital, and get her back to her baseline or above soon. I just want her to have a nice spring and summer. I also want to have wonderful family experiences without the worries of germs all the time. Off to check on her numbers and do a treatment soon (unless my hubby does this one since I’ll do the night ones). Thanks in advance for prayers again.